The game is a tune-up before their first cactus league game against the San Francisco Giants on Sunday. The intrasquad game will only be three innings. Taylor Jungmann, a first round draft pick by the Brewers last year is scheduled to pitch, along with Tyler Thornburg, Mark Rogers, Dan Meadows, and Manny Parra. The lineup card can be seen here. This lineup looks like a possible lineup for opening day; no doubt, we will see many lineups before the regular-season opener. 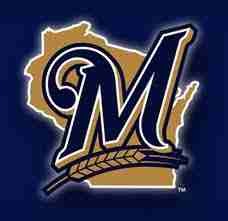 MLB network will show the Brewers game Monday night at 8:35 PM central time against the Giants. Brewer’s manager Ron Roenicke has told the team he would like to run more this year, Roenicke wants to work on manufacturing more runs. Under previous manager Ken Macha, players were instructed not to run, because he did not believe in making an out on the base paths. Corey Hart is all for the aggressiveness on the base paths, Hart said, when you get away from running for a couple years it’s hard to get it back. Carlos Gomez is without a doubt the fastest on the team, but has limited playing time because of platooning with Nyjer Morgan in centerfield. Mat Gamel taking over first base for the departed Prince Fielder will get his chance to prove himself in the majors. Corey Hart thinks he’s ready and says he has a good feeling about the 26-year-old Gamel. A third baseman originally, he moved to first base at AAA late last year, to be a possible replacement for the possible loss of Prince Fielder to free agency. 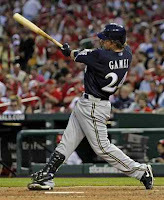 I think that the numbers Mat Gamel has put up in the minors, and consistent at-bats, knowing that the job is his to lose, will show he is ready. Till next time. Go Brewers! The Brewers renewed the contract with reliever John Axford for $525,000 for 2012 Today. Talks for a multi-year contract are to continue according to sources.